After a 93-year-old pipe on Sunset Boulevard burst yesterday afternoon, spewing an estimated 10 million gallons of water before the valves could be safely shut off, UCLA’s campus flooded. Pictures of the catastrophe, which turned the university’s main walk into a waterway and its Drake Stadium into a pool, went viral on social media. 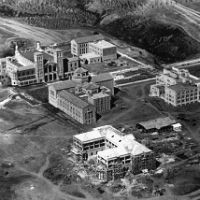 The pictures are striking—but so is the fact that UCLA has a little known history with H20. 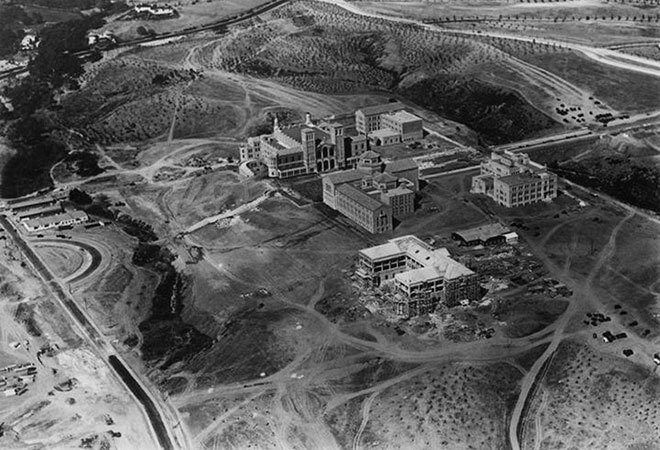 According to researcher and anonymous blogger, Militant Angeleno, the land near the foothills of Santa Monica where UCLA now sits had rivers and creeks including the West Arroyo, Foothill Stream, Stone Canyon Creek, and East Arroyo when the school settled there in the 1920s. These mini-rivers fed into Ballona Creek until they were filled in as the campus developed. Those familiar with UCLA may be able to spot remnants of rivers past. Though it looks like a low wall now, the bridge that once stood over the arroyo still exists near Dickson Court.